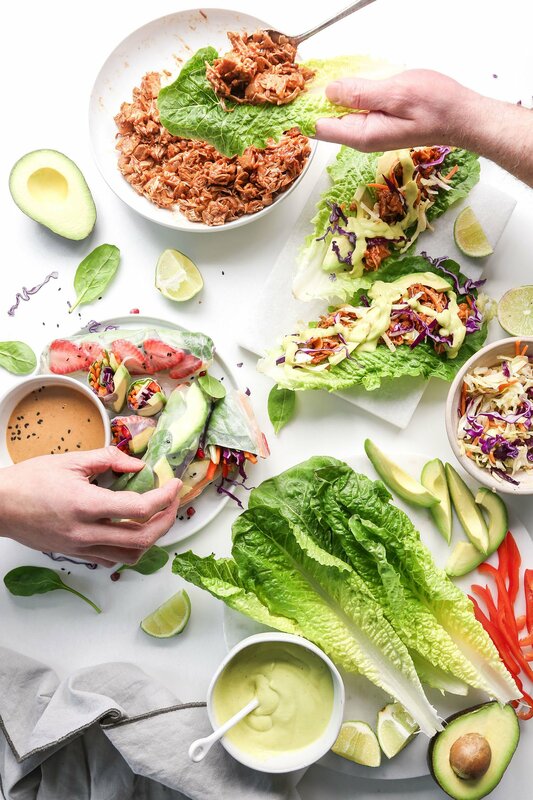 These quick and healthy lettuce wraps are full of flavor and made with a surprising ingredient—Jackfruit! It has all of the flavor of traditional BBQ pulled pork, but vegan friendly and plant based! Topped with a crunchy slaw and creamy avocado aioli, these lettuce wraps make a hearty Game Day snack or delicious dinner! Pull apart romaine lettuce leaves and wash well. Pat dry and set aside. Make the dressing for the slaw by combining oil, lemon juice/vinegar, zest, sweetener, salt and pepper. Mix and adjust seasonings, to taste. For the BBQ jackfruit, place a large sauté pan over medium hight heat and drizzle with oil. Add chopped onion, cooking a few minutes until translucent. Add jackfruit, BBQ sauce, and water, cooking until the BBQ sauce cooks down and coats the jackfruit, about 5–8 minutes. Season BBQ with salt and pepper, to taste. Cover and keep warm until ready to use. To make the avocado aioli, place avocado, oil, garlic, lemon juice, yogurt/mayo, and a pinch of salt and pepper into the high powered blender or food processor. Blend until creamy, then add water a little at a time, until aioli is thin enough to drizzle.